Wow. This William C. Morris Debut Award winner has it all. Charm & Strange, the first novel by Stephanie Kuehn, is amazing. I read a lot of YA fiction and this book is just a cut above. Way above. Win has attended a boarding school in New England since he was twelve. A top-ranked tennis player, Win once hit an opponent across the face with his tennis racket. He’s a lot of things. He is prone to motion sickness. He’s cold. Dangerous. Broken. Their relationship is tentative because Win tends to stay away from people. His only other ‘friend’ is Lex, his former roommate, but even their relationship is strained. Charm & Strange is a compelling story about dark secrets and how they can twist lives. Kuehn skillfully pulls the reader along a path that is almost too painful to read about, but she does it so well that you just can’t stop turning the pages. The novel is layered: Sixteen-year-old Win at school is told in first person sections called ‘matter’ and ten-year-old Drew at home with his family (first person narrative in sections called ‘antimatter’). Win and Drew are the same person, and the reason for the name change will be revealed in due course. Win’s family: professor father, depressed shadow of a mother, older brother, Keith, and younger sister, Siobhan, are important characters is Win’s story. This novel is so cleverly constructed; every page offers just a little more of Win’s story. Win is convinced he is about to change and not in a good way. “Good,” I snarl, and he laughs even harder than before. My hands curl into fists. I want to shut him up. Lex notices and skitters toward the door. Charm & Strange is a terrific book. I am having a hard time articulating how amazing it is. It is almost relentlessly bleak and yet as I closed the final pages I felt confident that despite Win’s dark past, the beast within would be tamed. 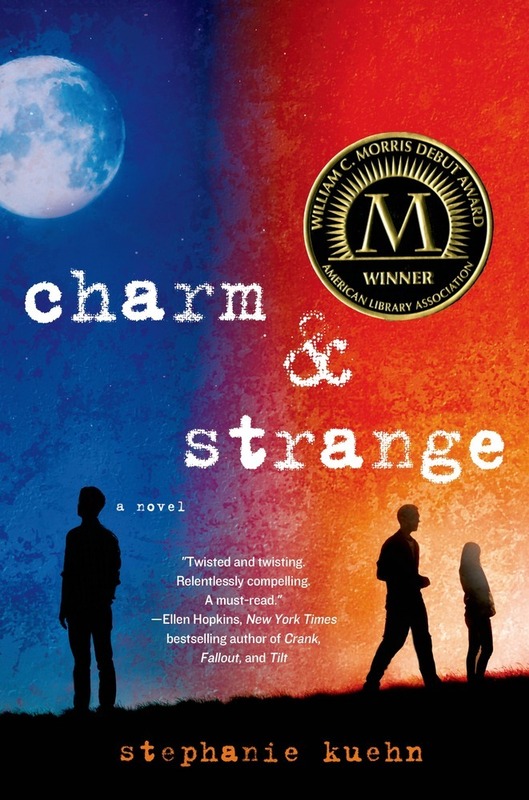 For mature YA readers, Charm & Strange is one of the best of the bunch. This entry was posted in Uncategorized and tagged award winner, Book Review, highly recommended, mature teen, YA by Christie. Bookmark the permalink.